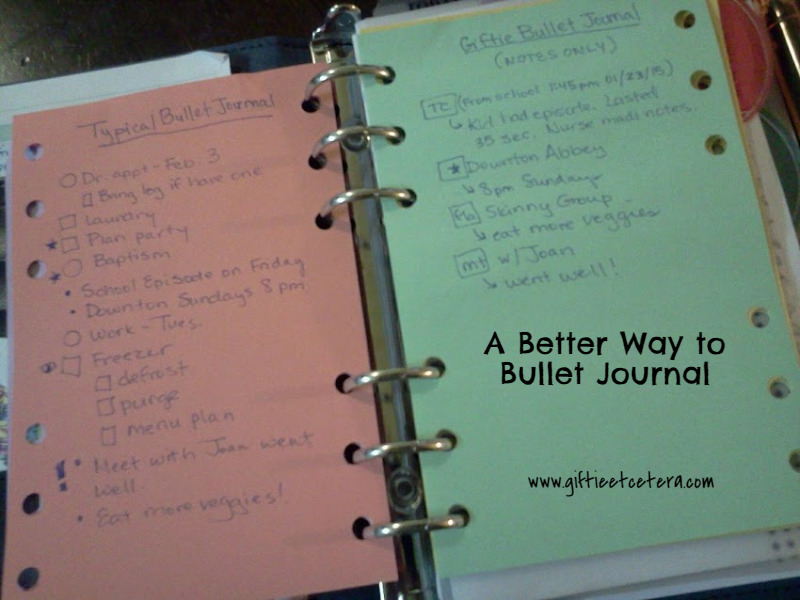 Bullet journals are the latest craze in the planner community. Honestly, I kind of HATE the idea of bullet journaling as planning. The hate doesn't rise to the level of my hatred for mayo, bare feet on carpet, lies on Facebook, or the violin, but it's still a pretty intense level of negative emotion. As much as I love the orderly look of a bulleted list of items in a notebook or planner, I rely heavily on the visual impact of the planner pages, created by grouping items and using day and time slots. I need symbols that I develop (so that the symbols make sense to my brain and so that I remember them). And, no matter how much I try to brainstorm a reason to have a typical bullet journal, it just makes sense to separate tasks and events from notes. Bullet journals that mix in tasks only make sense to me as an initial brain dumb/capture device. So I created a better bullet journal. To be fair, I should explain how bullet journaling is done in the typical way. 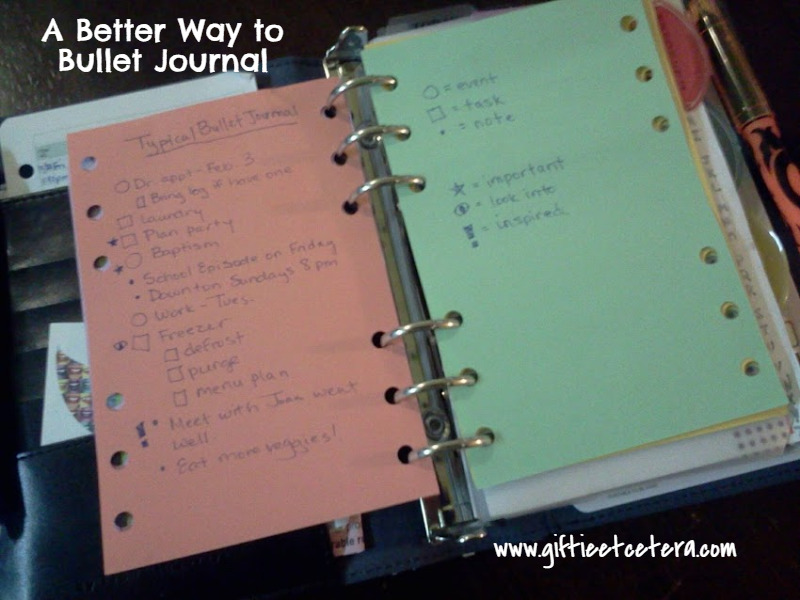 In a typical bullet journal, there is a running list of tasks, events, and notes. Using the codes seen below (on the green page to the right), a running list is created like the one below (same picture, on the orange page to the left). The typical bullet journal strikes me as difficult to read. The list on the left (typical) appears cluttered and it is difficult to distinguish between separate items. Also, though it allows for some subgrouping, if one entry has a ton of information, it doesn't work very well. Also, the little eye icon is messy and creepy. Compare it to my bullet journal, on the right below. On mine, you can quickly see where each entry starts - wherever there is a box. TIP: When creating bullet journal codes, put a box around them to make them stand out. Indent anything under the main entry (like additional notes or details). My bullet journal is completely shown in the picture below. Please consider pinning to Pinterest! Thanks! If the task is to set up a PROJECT, I circle a P.
If the task is to FILE an item (in files at home or in notes in the planner), I circle a F.
To mark a task DONE, I check the circle. To DELETE, I X the circle. To DEFER, I draw an arrow pointing forward through the circle. To DELEGATE, I draw an @ symbol (which, in my mind, means that I will do something @fter someone else does). TIP: Tasks go on the weekly pages instead of hidden among a bunch of random notes. Even if just a notebook is used, put the tasks on a certain pages and notes on another. #a simply means an a.m. time slot (e.g., 9a). #p simply means a p.m. time slot (e.g., 2:45p). An * indicates additional details (like an address or contact number). To indicate TELECOM, I write TC in the box. To indicate EMAIL, I write e'm in the box. To indicate MEETING, I write mt in the box. To indicate Facebook, I write fb in the box. A star means a note that does not belong to any of those subgroups. An arrow indicates additional information under the note. TIP: Always indent the arrow. But please don't limit yourself to my codes! The best bullet journal codes are not the typical ones OR mine. TIP: Don't skip the step of making a sheet like the yellow sheet as a reference for the bullet journal codes. It's important for memory creation and for reference. The best bullet journal codes and methods are the ones that you develop, for you. Those will make the most sense to your brain and allow you remember them easily. It's a lot like making a sandwich. World famous chefs will sometimes dress their very best sandwiches with mayo, but that sandwich is never the best one for me. I have been bullet journaling for about a year now and love it but, I have adapted it to my way of doing things also. Thank you for commenting. I think it's really important to hear from people with a different opinion than mine, so that everyone can make the best choices for their own planner in their own lives! :) I'm so glad it is working for both of you. I love the idea of bullet journaling, but it looks like chaos on the page when I try. I admire those that it does work for. The bullet journal is a great 'brain dump' method. This is how I use it. But what I don't like is the 'missing pages'. The idea that you can just start off where you left off is great except - what if I want to go back and add information that is date specific/critical? There is no easy way, in a regular bullet journal format, to do that. And yep, the eye is creep :-) I put eyelashes on mine. I do love the bullets though. I have made quite a few before I figured out which were useful to me. 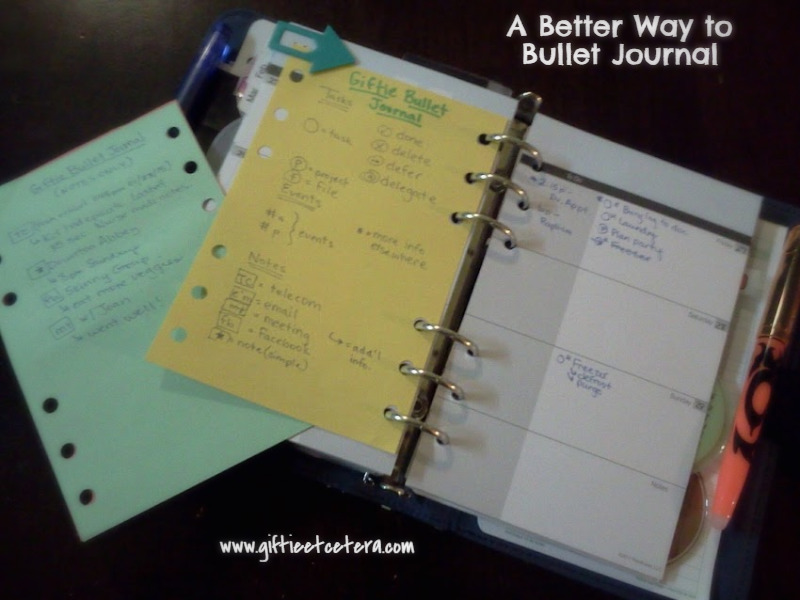 The process of exploring the bullet journal method was a path to planner system peace for me. So I would encourage anyone thinking about it to give it a shot. I know how unfair I am to the violin! I do. But I'm tone deaf and only hear screeches. That would be bad enough, but my (lovely) suite mate in high school practiced all the time. Now, I can't think of any excuse for mayo. That's just gross! My favorite is code is ! for inspiration. It's also the one I frequently forget to use. Ex: ! Look up crockpot recipes or ! bullet journaling in a planner. The exclamation point works much better for me when I use it this way. How can you possibly live in the South and NOT love mayonnaise?? Turkey, tuna, chic, or egg salad with too much mayonnaise is awesome!! My favorite symbols are the% for telephone call, and the ~ for text message. Example: % dear, sweet son of mine. ~ same: remind him to call me. I've used the FC system of bullets for many years, so it's fun to add something new. Carla P. I love that % sign. I just usually write 'call'. Funny thing how it never occurred to me - perhaps because it's a programmers symbol! Geeking out as I think of all the symbols (ascii/ansi) I could use! HoustonHomeSchool: Haha I do!! I think that would be an excellent post! It's hard to do no mayo. My mother-in-law and my mom both roll their eyes at me, a lot!